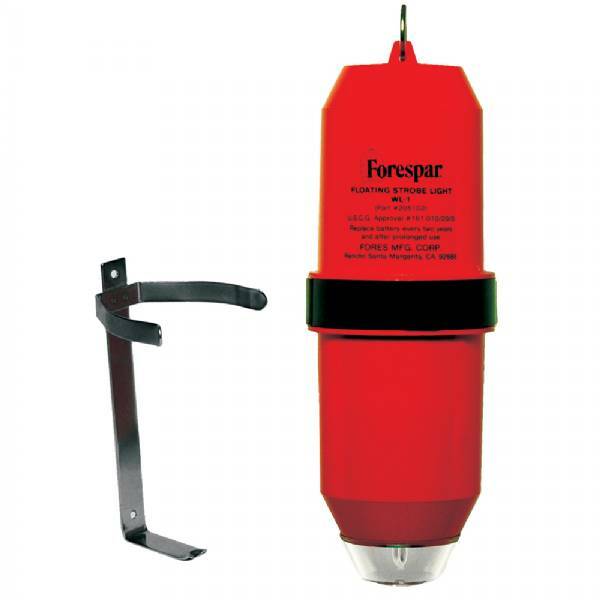 Recent intense technological developments in the camera industry enable Forespar® to bring you this advanced LED strobe light at a significantly lower price. Powerful LED strobe, operates with spring post 6V lantern battery, comes with bracket mount, USCG approved. Built to meet Code of Federal Regulations sub part 161.010; this rugged LED water light produces brilliant strobe flashes automatically when thrown overboard and is visible for miles at sea. When used with a 6 volt alkaline lantern battery (not included) it will flash at the U.S.C.G. required rate for over 52 hours and will still flash at least every 2 seconds after 7 days of continuous operation (meets U.S.C.G. requirements – 46 CFR-161-010). A stainless steel molding bracket is included. Dimensions are 11-1/2” long, and 4” maximum diameter.